2. This silk plaid shirt is lightweight enough to go from summer to fall and dressy enough to wear to work while still looking "cool"
5. Studded loafers for only $44? Yes please! Talk about nailing two trends with one shoe. Wonderful selection! I love the loafers! Loving those StyleStalker tuxedo pants! i am determined to successfully pull off wearing thigh-high socks. great finds btw! I have some black high socks but i never know what to pair them with! I still love them though. One of these days I will come up iwht an outfit! That fourth piece? WOW! I love it! I love all of your picks, but I am dying over the boucle jacket and the flats!! My magic price is $25.00 for items. I swear anything under that, even if I need to save money I am such a sucker for that price range. I've been seeing pants with stripes on the side, is that going to be in this year? Kinda reminds me of a pair of Angel jeans I had in 8th grade that had 2 giant stripes down the side! haha! #3 Thigh highs...yes, please! 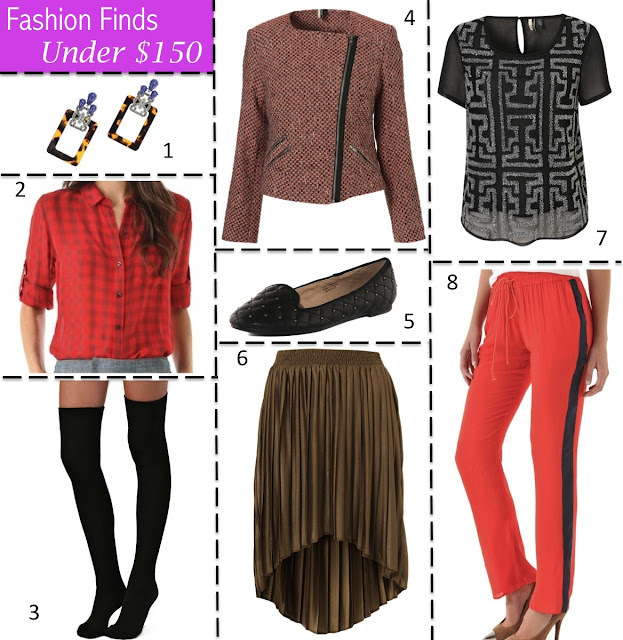 #4 Can't resist a good boucle moto jacket! #7 Fun tee is so versatile! Great post! the outfits are so nice *_* i love it to read fashion blogs :)) your blog is very good. follow? keep in touch! Love your combinations, you have a great eye! I am in love with that dress in #6 but all of your choices are great. What great picks! i love your style! love those pants and the j.crew earrings! We love your post, it's wonderful and we're always here giving all noviades. We campaign with Google +1 and we appreciate your participation.